After posting Will the Real 4th of July Please Stand Up on July fourth, this is my sequel. Smile, hopefully Big Brother is not watching you on camera yet. 35.5 Million: Number of People Traveling by Car to celebrate the 4th of July with family and friends. 68.3 Million Total cases of beer sold [at 24 beers a case, that is more than 1.6 billion beers] on Independence Day weekend, the most popular holiday for beer purchases, followed by Labor Day, Memorial Day, Father’s Day and Christmas. 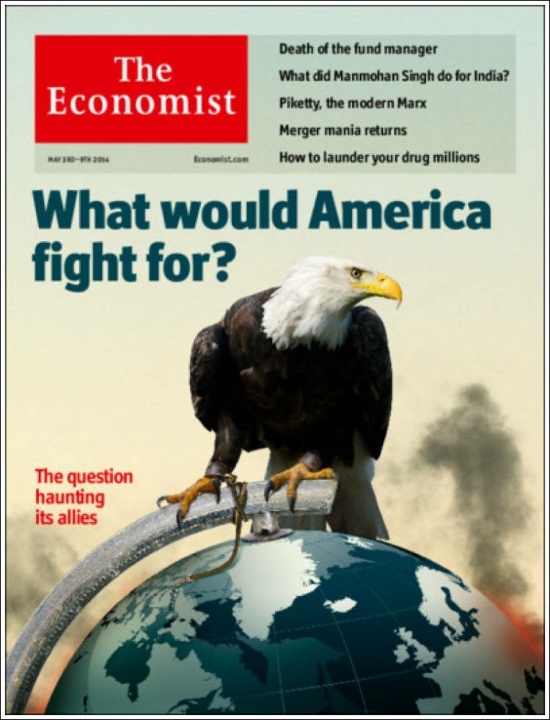 Correct me if I’m wrong, but aren’t these all democracies? About 42.6 percent (103 million) of the people celebrating the Fourth this year will attend a fireworks display or community party, while 11.5 percent (27 million) will watch a parade, according to the National Retail Federation. Millions of American flags are actually manufactured abroad. Nearly all of them – 97 percent – came from China last year, which sold us $3.5 million worth. More than 48 million Americans will be shopping for decorations, apparel and party supplies this Independence Day, with average household spending jumping up to $71.23 – 4.5 percent higher than 2014’s $68.16 per household. Voter turnout dipped from 62.3 percent of eligible citizens voting in 2008 to an estimated 57.5 in 2012. That figure was also below the 60.4 level of the 2004 election but higher than the 54.2 percent turnout in the 2000 election. How would you measure patriotism—by the number of beers one drinks on the 4th of July or if they voted on election days? While I’m an apple pie fan, my thoughts were not on fireworks or celebrating the 4th. My wife, who arrived in America in 1986 on a student visa from China and who is now a U.S. citizen, is the one who bought the flag that hangs outside our house. My job was to install the bracket for the flag, and while installing the flag a lot of conflicting thoughts were running through my head. For instance, the reason I don’t go to fireworks shows is because of the PTSD that came home with me from Vietnam as a U.S. Marine—a war that was based on lies by a U.S. President just like the war in Iraq. I was thinking of the Swift Boat Veteran campaign against Kerry when he ran for president and how G. W. Bush probably won that election when he was a coward who used his family influence to keep him out of the war. You see, Kerry served in Vietnam on a swift boat and he was wounded more than once. He even held dying friends in his arms. Yea, they were close calls for Kerry, flesh wounds, but they were still wounds, and even though the rounds, rockets, and mortars that came close to me never cut flesh, close is still too close because an inch more and bam you might be crippled or worse, dead. And the Koch brothers aren’t alone among the billionaire oligarchs who are out to destroy our people’s republic. There’s Bill Gates, Eli Broad and the Walton family waging an all-out war against America’s democratic, transparent, non-profit public schools to close them down and turn our children over to for profit, opaque, undemocratic corporate Charter schools to teach. Bill Gates even wants to put Big Brother in every public school classroom by installing video cameras to spy on every teacher and make sure they are doing what Big Brother wants them to do with the so-called Common Core crap. In fact, I’m reading a book right now that keeps me awake at night. The book is about a conspiracy that isn’t a theory and it’s like reading a true crime novel but one that is based on the crime as it is happening instead of after the criminals were caught, tried, convicted and sent to prison. The book is called Common Core Dilemma – Who Owns Our Schools? by Mercedes K. Schneider. And I keep asking myself as I’m reading the book—I’m almost done and then I’m going to write a review—why the conspiracy this book reveals isn’t front page news in our corporate owned and controlled media. Then I tell myself I already know the answer: 90% of the traditional media is owned by six huge corporations and one of those media corporations is controlled by Rupert Murdock. Then as I stand there watching the wind rippling the stars and stripes hanging from a flag pole attached to the side of our house, I think, how many Americans really represent the United States our Founding Fathers gave us—who reads and votes? In the 2014 election, fewer people turned out to vote than any election in the last 70 years. In the 2012 Presidential election, 64% of eligible voters voted. The biggest excuse is they were too busy to vote (17.5%) or they were just not interested (13.4%). And the turnout for the 2014 election was the lowest since World War II at 36.4% and look what we got. Of all the socioeconomic factors impacting voter turnout, education has the greatest impact. The more educated a person is, the more likely they are to vote, as they have a better understanding of how the system works, how to influence the system, and why participation is important. Thinking of the voter turnout, I ask myself: How many Americans celebrate the 4th of July with a barbecue, hot dogs, beer, apple pie and fireworks—the rockets’ red glare, the bombs bursting in air? The 4th of July holiday makes for a great party atmosphere, doesn’t it? I was also thinking of the Fairness Doctrine (1949 – 1987). The Fairness Doctrine was a policy of the United States Federal Communications Commission (FCC), introduced in 1949, that required the holders of broadcast licenses to both present controversial issues of public importance and to do so in a manner that was, in the Commission’s view, honest, equitable and balanced. The Fairness Doctrine was eliminated by two U.S. Presidents on the excuse that it was a violation of our freedom of expression: Ronald Reagan followed by the first Bush to live in the White House. Does freedom of expression also guarantee the right to lie and mislead the public? Will the real 4th of July please stand up. Maybe we can’t blame the Obama administration for all of what happened at the VA. Maybe the GOP is responsible for wrecking the VA medical system so it broke down and was failing in its mission long before Obama was sworn in as President and moved into the White House. The American Legion reports that a Department of Veterans Affairs memorandum written four years ago warned that “inappropriate scheduling practices” were being used at some VA medical facilities “in order to improve scores on assorted access measures.” These practices were sometimes referred to as “gaming strategies.” The document, dated April 26, 2010, was written by William Schoenhard (appointed to the VA by President Obama in 2009), who then served as VA’s deputy under secretary for health operations and management. The nine-page memo lists several specific scheduling practices to avoid. President Obama appointed Eric Shinseki as the US Secretary of Veterans Affairs in 2009. Arne Duncan, who is orchestrating the destruction and dismantling of the democratic U.S. Public schools was appointed by President Obama to be the US Secretary of Education in 2009. FCC Chairman Tom Wheeler was appointed by President Obama to lead the US Federal Communication Commission in 2013, and now he is attempting to end Internet Neutrality and allow corporations to control the Internet with pay to play power to choke anyone’s site from being easily accessed—a clear form of censorship. What does this tell us—that Arne Duncan after being connected to fraud and lies in the Department of Education will be with us until the end of 2016? See Smoking Gun 1 and 2 to discover the scandal at the Department of Education and how that is also being ignored. When will memos and e-mails of Duncan’s incompetence and fraud be splashed across the media, and when will Republicans (the GOP) admit that America’s public schools are the best in the world and the problem is poverty (see Smoking Gun)? What’s going on? First the Public Schools and now the VA! First: Under President Clinton and a Congress dominated by a GOP majority, the Glass Steagall Act of 1933 that was meant to protect the United States from another Great Depression was repealed in 1999 leading to the Great Recession of 2007-08 under President G. W. Bush, the 2nd worse global financial disaster since the Great Depression. Second: President G. W. Bush—with approval from a GOP dominated Congress—enacts the 2001 No Child Left Behind Act and the U.S. Government declares war on its own Public Schools under the false claims that the public schools are failing when they aren’t. Third: President Obama, with overwhelming approval from Congress enacts Race to the Top in 2009 along with the Common Core Standards as part of the American Recovery and Reinvestment Act escalating the White House’s war on Public Education to Machiavellian levels. Fifth: A very real threat to Net Neutrality. Network neutrality is basically the principle that Internet access providers—[including] companies like Verizon, AT&T and Comcast—shouldn’t discriminate in how they handle traffic on the Internet. And without this neutrality, the Internet also becomes “Pay to Play” or vanish into obscurity. Sixth: Now medical care through the Veterans Administration (VA)! Since the late 1990s under President Bill Clinton, the VA became an efficient model medical care system, and President Obama can’t reform something that works so what’s the best way to change that? The answer: make sure it needs reforming by introducing corruption through the VA’s top leaders. The Obama Administration and the Congress seem hell bent to privatize government. The public schools are in the middle of an all-out war with the federal government to turn education over to private sector Charter schools that are riddled with corruption and mostly worse than the public schools. It also seems that the VA is under attack as services and support has been eroding under the Obama White House and Congress. Does this mean the VA has also been targeted to be privatized just like the public schools, prison systems, and even the military? After all, if the VA failed to provide adequate services, then the White House will have an excuse to demand reforms and that usually means privatization. The American Legion may demand changes within the VA but the problem originates from the White House and a neo-liberal president and his administration, who have clearly signaled that they are allied with neo-conservatives in the Republican Party with a common goal to privatize most if not all of government services. Once the VA, the public schools, the military and the prisons are turned over to private sector, for profit corporations, does that mean the Constitution and Bill of Rights will be meaningless. After all, what the Founding Fathers wrote in 1776 was meant to protect all U.S. citizens from their own elected government and not private sector corporations (that didn’t exist in the 18th century) run by billionaire oligarchs and CEO autocrats. For instance, the 1st Amendment freedom of speech protections only protects Americans from their elected federal and state governments. The 2nd Amendment’s right to own and bear arms also protects America’s citizens only from our elected governments—the feds and the states can’t legally take away a citizen’s right to own firearms. But what happens when there is only a puppet government owned by the wealthiest 1% of Americans and all federal and state services have been turned over to, for instance, Bill Gates, Eli Broad, Michael Bloomberg, the Koch brothers, the (Wall-Mart) Walton family, and Hedge Fund billionaire’s on Wall Street? Imagine what will happen if the IRS is turned over to Microsoft or Rupert Murdock’s Media Corp; if the U.S. Forest Service is privatized and turned over to the Koch brothers, and if President Obama is successful in doing away with Internet Neutrality. Who crowned Bill Gates the Emperor of Education? Make no mistake, there’s a war being fought in America. It started about thirty years ago; when G. W. Bush was president that war heated up—with Obama it just got hotter. There are a number of key players with goals to take over America’s democratically run public schools. These billionaires will spend millions on propaganda spreading lies to deceive. On December 4, 2013, a New York Times headline shouted: “Shanghai Students Again Top Global Test”, and once again, America’s critics of the U.S. Public Schools called for more reform. A good site to discover the major players behind the war to take over America’s democratic public schools and follow the battles being fought across America may be found at Diane Ravitch.org. 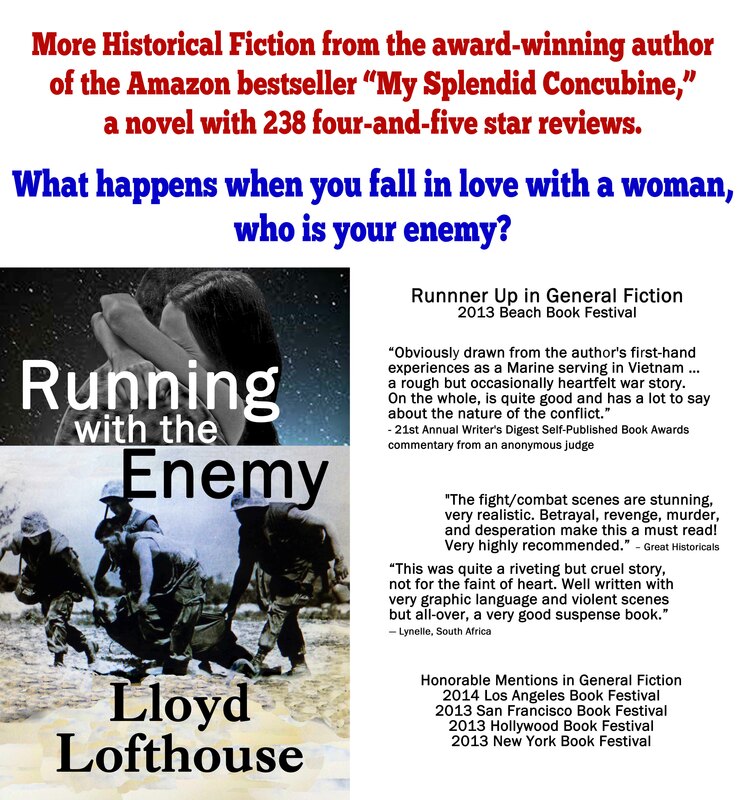 His latest novel is the multi-award winning Running with the Enemy that started life as a memoir and then became a fictional suspense thriller. Blamed for a crime he did not commit while serving in Vietnam, his country considers him a traitor. 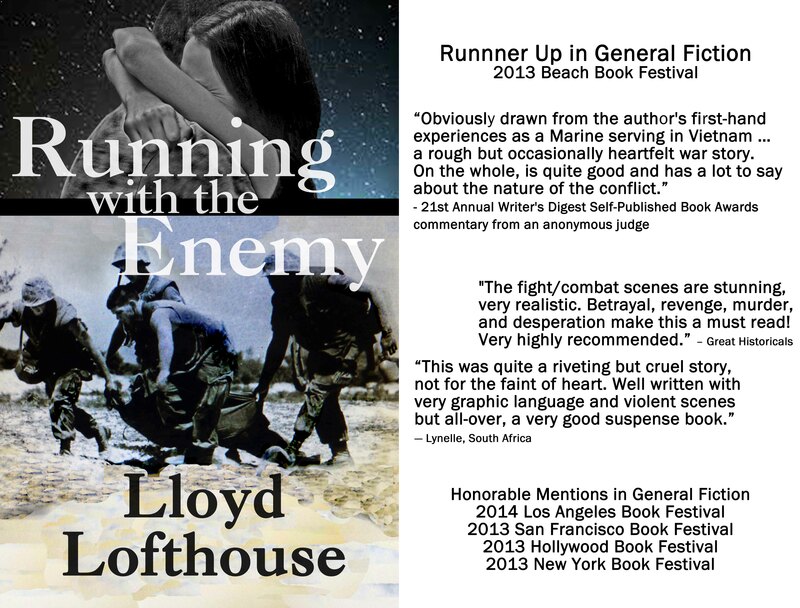 Ethan Card is a loyal U.S. Marine desperate to prove his innocence or he will never go home again. Recently, I logged on to discover another story about a father serving in the United States Navy returning home after a six-month overseas deployment. I’m a sucker for this genre of YouTube homecoming videos, because as I watch them I relieve that moment forty-seven years ago in December of 1966 when I returned home without warning at three in the morning after a combat tour in Vietnam. I wrote about my return in Coming Home. There was no YouTube back then. It’s powerful moment to watch a family reunion when a military father or mother returns home from a dangerous war zone. However, this time I questioned why this homecoming should gain national attention in the media. What was unique about it? I was curious where he served the other four times. Maybe one or more of those deployments was in a more dangerous place than Diego Garcia. The island of Diego Garcia is really remote and isolated. It’s 1,970 nautical miles east of Africa, 967 nautical miles south-southwest of the southern tip of India and 2,550 nautical miles west-northwest of the West coast of Australia. For years I imagined the island of Diego Garcia was a desolate, freezing rock surrounded by nothing but a brutal, stormy ocean. Then I searched YouTube and discovered I was wrong—really wrong. Diego Garcia is a tropical paradise with warm to hot temperature year around and if you watch the embedded video above you will discover breathtaking beaches and crystal clear water. In fact, the vast majority of Navy deployments are at sea on Naval ships and submarines inside metal hulls. Some of those deployments are in dangerous waters like the Persian Gulf, the Gulf of Aden or the Red Sea. Then again, maybe it was the uniqueness of that Indiana corn-maze that made this homecoming a worthy news item, and it really had nothing to do with a Navy father coming home from a tropical paradise. And it’s cute to watch a young daughter throw herself in her daddy’s arms because he’s been away from home for six months.